Kitchen Countertops Maintenance & Tips How Can I Restore the Shine on My Formica Countertop? Usually, Formica countertops are found in modern looking kitchens as their hard, plastic laminate surface comes in a wide range of finishes, textures and colors. 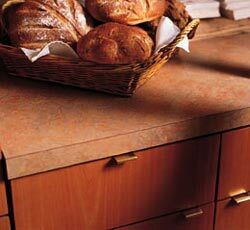 Also, Formica countertops are well known for their ability to withstand cuts and dents and durability. However, over time, a Formica countertop can show noticeable signs of wear, including nicks and dull spots in its finish. In this case, you should restore the shine to the Formica countertop instead of completely replacing it as this process is a lot easier and cheaper as well. In order to restore the shine to the Formica countertop, you will need the following things: a quality and mild detergent, warm water, furniture polish, fine grit sand paper, 2 soft cloths and sanding block. Start by mixing a solution of mild detergent and warm water and wipe down your Formica countertop by using a wet, soft cloth. Make sure that you remove all the debris from your countertop before starting to restore its shine. Next, you will have to dry your Formica countertop with a soft and dry cloth and allow the whole surface to air dry completely. Affixing the sand paper is what comes next  affix it to the sanding block and sand your Formica countertop by using circular motions. Make sure that you concentrate on particular spots that have stains, gouges and nicks in their finish and remove all these spots as best as you can. Next, you will have to wipe your Formica countertop again by using a soap and warm water solution  clean off any sanded and dust particles. Allow your Formica countertop to air dry and spray the furniture polish generously on the dry cloth in order to wipe the countertop with it. Make sure that you apply any additional polish that is necessary. Keep in mind that these instructions are likely to work best when used in the case of lighter colored Formica kitchen countertops. Another way to restore the initial shine to your Formica countertop is by using a simple cleaner that contains ammonia as one of its active ingredients  ammonia should restore the initial shine to your Formica countertop. Abrasive cleaning can also be used  just make sure that you buff your Formica countertop with a quality and slightly abrasive material  for instance, you can use a Scotch-Brite or a simple sponge. Make sure that you do this at least 5 times a week and even if it may take some extra time, the shine will eventually come through.